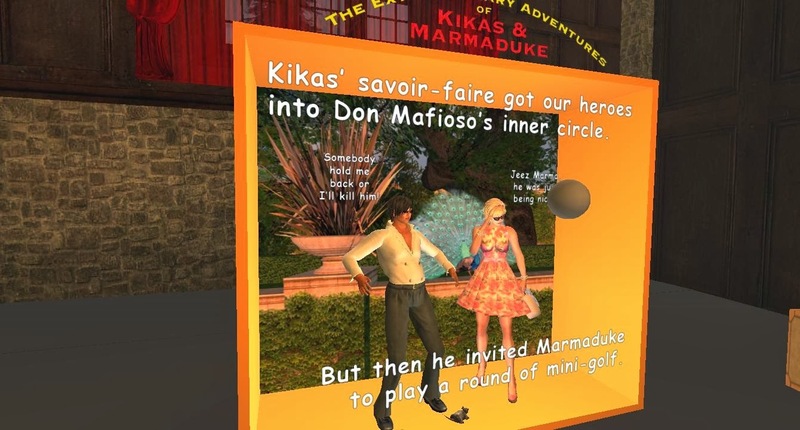 Two of my oldest friends in Second Life are Kikas Barbenco and Marmaduke Arado, partners not only in SL but also real life. 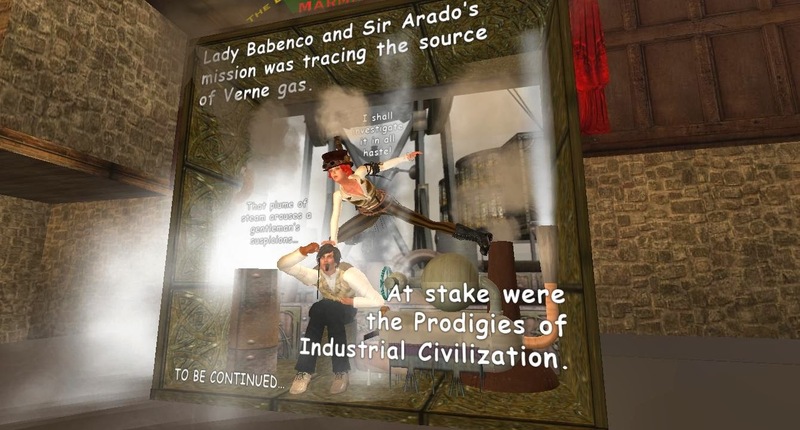 They are performers of wearable art at many events and regions around the Second Life grid. They also live in my home sim, Thorstar, where they have a home that I can only describe as a reminder of a visit I made to a Mardi Gras float factory in New Orleans , LA, USA. There are items of interest that can be used to create their scenery for their plays waiting to be used. They have all the possible items you can find all around the sims mostly great freebies. Kikas wardrobe is the envy of everyone who watches the shows . Marmaduke has wonderful tuxedos and great bathing suits ... and physique. Wednesday I was able to attend a performance in LEA2. KG Shine, titled, "Me Kikas, You Marma: The Extraordinary Adventures of Kikas and Marmaduke." All their art is put on behind a red curtain. When the curtain rises Kikas is usually in some difficulty from which Marmaduke must save her ... however Kikas is sometimes (mostly) the heroine of the story. Some scenes are frightening, some humorous, some that seem to be private and the audience becomes an intruder. Their misadventures are often unimaginable except in the mind of the creators, but such fun. Peeking behind the curtain is frowned upon but is enlightening. The first few times I went to see their shows years ago they were so simple and cute with a few wearable art pieces and short in duration. They have progressed so far in their scenery and story lines it is amazing. I love to see their shows, always something new. Many artists attend to see the performances. The audience enters into the spirit of the show and expresses its thoughts openly which adds to the performance.Kikas and Duke enter into the fun with their responses. If you are interested in seeing their performances you may join their group for notices: The Wearers.